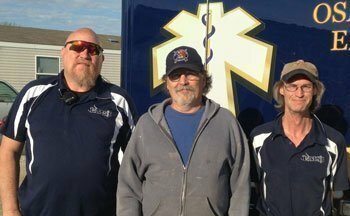 Randy, center, a stroke survivor, recently met with Osage County EMS personnel, Greg, paramedic, left, and Curt, AEMT, right, who provided emergency care when Randy was having a stroke. This past weekend was a reunion for an Osage County EMS crew and one of their patients. On Sept. 20, Randy became a stroke survivor. He had just walked out of the house to run errands. A few minutes later his wife, Terri, found him still sitting in the driver’s seat of his truck. She recognized he was having stroke symptoms and called 9-1-1. Osage County EMS arrived, promptly assessed Randy and confirmed he was indeed having a stroke. They initiated their stroke care protocol and transported him to the emergency room of a verified stroke hospital for specialized care. Randy became a stroke survivor that day not by luck, but due to a specialized comprehensive stroke system of care. Thanks to his family contacting 9-1-1 immediately, a rapid stroke assessment and emergent care by the EMS crew, advanced invasive interventions by the stroke hospital, Randy was released from the hospital two weeks later. Just a few years ago a stroke was viewed as a debilitating life change. Advances in emergency care have changed that. A stroke is not only survivable; it can be a fixable event, if treated quickly. May is Stroke Awareness Month. Learn to recognize the most common signs of a stroke. If just one of these symptoms is present, there is a 72 percent chance of it being caused by a stroke. If you suspect a stroke, call 9-1-1 and activate EMS immediately. The patient has a better chance for improvement the earlier that an EMS provider can perform a specialized stroke assessment, provide emergency care and transport the patient to a verified stroke hospital. For more information, contact Donna Connell at 785-528-1139 or visit www.ksems.com/OsageEMS.htm or www.facebook.com/OsageCountyEms. Information provided by Osage County EMS, which thanks Randy and Terri for allowing their story to be told in an effort to increase stroke awareness.